Today (October 17) is the debut of the “real” Windows 8, thank goodness. And a perfect time for reflections on my love/hate affair with Microsoft. I love Microsoft. 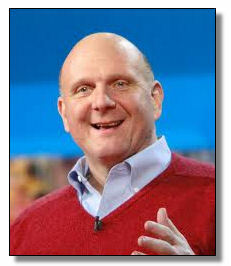 I envy Steve Ballmer’s hairline. Microsoft Office is the greatest thing since the invention of the personal computer. I love Office so much I refuse to buy a tablet computer (iPad, Galaxy, Note, Surface RT) because almost none of those plastic/glass doo-dads will run my favorite programs – Word, Excel, PowerPoint, Publisher and OneNote. Microsoft employs 40,000 people in my hometown area of Seattle, which vastly improves the quality of life here. Microsofties leave the company to found their own startup companies which makes for a really exciting technology scene – just ask Todd Bishop or John Cook at Geekwire. I love the X-Box 360 and I love Microsoft Research with products like web-based translation. And the Kinect is leading us into the future of gesture-based computing. I love Microsoft so much I say “bing it” when others say “google it”. I hate Microsoft. Steve Ballmer laughed at the first iPhone because it didn’t have a keyboard. His answer: the “Kin” twins which lasted one month. Microsoft completely missed the tablet revolution, until it finally, three years after the iPad, came out with the Surface RT with zero apps and almost complete incompatibility with everything else in tech. Windows 8 and its Metro interface is a travesty. What were Ballmer and his brain trust thinking when they rolled out Windows 8? They urinated off on every Enterprise and Enterprise desktop user of Windows, a billion or more users in all. There is zero zip nada which is nice about Windows 8 and the #@%! “metro” interface for folks using a keyboard and mouse. I resisted buying a Windows 8 computer because I don’t have a touch screen and I knew it would be tough learning to use Win8, but I had no idea how bad until now, when I actually have to use it. Finding simple stuff like the control panel is a monstrous chore, as are other simple tasks such as closing a Metro window for Adobe reader. How the hell do you “swipe up” with a mouse? Half the time the “charms” never appear when using a mouse. I could go on-and-on but I’m totally baffled why Microsoft would spend all this time and effort on a new, touch-screen optimized OS when their bread-and-butter is enterprise customers using desktop computers with no touchscreen. Does Steve Ballmer have a death-wish for his company? Even folks who use touchscreens spend little time in Metroland and most of their time on the “traditional” desktop interface, if they can find it. There are plenty of rants about this on the web of course, too, including ones on microsoft.com. Love Windows Phone 8 smartphones. Woulda bought one when I ditched my Blackberry in May, 2012, but only Windows Phone 7 was available and that hardware was NOT upgradeable to version 8. Had to get an iPhone instead, unfortunately. Love all the apps available for Windows desktop computers. Hate all the apps not available for the Surface and Windows Phone. Love tablet computing – I used a Gateway tablet running Windows for years starting in about 2003, and my 3.75 year old kid uses a gen 1 iPad all the time. Hate Ballmer and Microsoft’s failure of vision to miss the whole smartphone and tablet computer revolution. Especially since Microsoft partners HAD tablet computers using Windows XP and developed the Surface tabletop computer. Love all the power of the Internet with websites, web apps, open data and all the rest. Hate that Microsoft basically missed the whole Internet revolution, brought us stuff like Front Page and Silverlight and MSN, and is playing catch-up ever since. Love that the entire world uses Windows desktop computers and Office as THE standard for productive computing. So much so that some of those cities and places which have converted to gmail and Google apps are regretting that decision (i.e. Los Angeles). Hate Microsoft running after consumers with the ill-fated Zune and poor Windows 8 implementation, dissing their cash-cow livelihood: Enterprise customers. Redmond sign – how about software? So after all the harping and carping on my favorite hometown company (although Boeing and Amazon are actively competing for that “favorite” spot), do I have some advice for my friends and their new CEO in Redmond? You bet. Keep your Enterprise friends happy. You do a good job serving corporate America, governments and businesses. Don’t screw them with crap like Windows 8. (Fingers crossed for a decent Windows 8.1). Microsoft Research is great at innovating. Use them. For just one example, capitalize on Kinect gesture-based computing. Actively encourage people to link Kinect to all sorts of other tech from computers to TVs to cars. Continue to develop the Xbox into the all-purpose home device for entertainment and personal business. · Concentrate on voice. Voice control of computers will leapfrog the touchscreen interface. I spend a lot of time in my car – I’d love it if my smartphone could read me my email and text messages allow me to compose tweets and Word documents, all by talking to it. Voice would allow my 3.75 year to say “I want to watch Caillou” and her tablet would start Netflix and ask her “Do you want Caillou the Chef” which it knows is her favorite. Embrace the “internet of things”. Over the next 20 years, sensors will be deployed everywhere – electrical grid, roadways, autonomous vehicles, medical patients, appliances, even toilets and toasters. Myriad opportunities exist in this space, starting with just crunching and making sense of all that data. Microsoft, I love you. I desperately want you to succeed. Please stop shooting yourself (and your customers) in the foot.